L'Occitane Verbena (Verveine in French; shown above) is a blend of lemon verbena, lemon tree and geranium. It has a nice fizzy start, mildly green and very crisp. The dry down is tart but sweet, and smells just like lemon sorbet. Just as I am starting to wish it was just a tad drier, the whole thing is over and it is time to reapply. It is a simple fragrance, perfect for hot summer days, and if you can snag one of the glass spray samples, it is a great thing to keep in your purse. It doesn't last, but it is a very happy scent while it does, and it is reasonably priced. The Eau de Toilette is $40 for 100 ml. I could swear that they used to have a smaller size, but I don't see it at the store these days. It also used to come in a tin of solid perfume (cheaper, and great for layering) but that seems to have been discontinued. They do have a "cool stick" — a solid in a lip balm-like tube — but I've never tried it. There is also a body milk, shower gel, soap, hand wash, room spray, candle and scented shea butter. Le Couvent des Minimes' Verbena & Lemon is very similar to L'Occitane's. It is perhaps slightly drier, and slightly greener. To my nose, it doesn't have quite the same sparkle, and although neither fragrance lasts for long, the Couvent des Minimes goes flat even faster. Like many lemon fragrances, it also has a bit of a household-cleaner vibe. 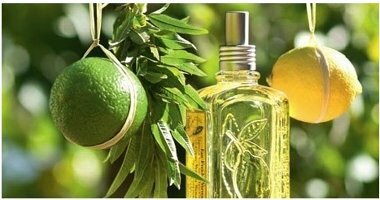 I don't notice that with the L'Occitane, but I've seen the L'Occitane compared to Lemon Pledge many times so perhaps I am alone in that. The Eau de Toilette is $28 for 100 ml, but you can get a 30 ml travel spray of the body splash for $5, and I can't see spending much more. Other products in the fragrance line include shower gel and body lotion. Great review R! I used to be a fan of Verbena perfumes. Have boring tastes lately. Must be this awful grey winter. Hope you are well. I just discovered the Le Couvent des Minimes line this past weekend at Bath & Body Works. I picked up what I thought was a L'Occitane small trial pot of body cream. I got the Orange Blossom cream and it is lovely, which of course made me want to try this one next. I think you might really like Elizabeth W's Citrus Vervain. I love the L'Occitane Verbena–it's one of my summer stand-bys. They also make a cooling body gel (similar to the cooling stick, probably) that is *amazing* when it's really hot and humid! The cooling sensation doesn't last forever, but while it does, it's like having your own personal a/c. Ah, I should have tried layering it with L'Occitane Mint Green Tea. Oh, will have to go back & try that cream. I got a tiny little pot of Bigelow lemon cream, but the scent is way too light for me. Have tried the Elizabeth W but only on a test strip. The store near me that has the line never has samples. Sounds interesting, maybe I need to try the cooling stick. I didn't see the cooling gel last I was there. Really wish they hadn't discontinued the tin of solid perfume! Their Shea Butter items and some of their skin care is also wonderful. I love L'Occitane. My mother loves the Lavendar linen spray, and I lquite a fan of their candles as well. Well, maybe try the shower gel or the body milk. Both are nice, and a lot cheaper than Doblis! I was sort of disappointed with the Shea. It is not very highly scented, which some people might prefer I guess. The rest of the body products are great. Great Review! I have never seen Le Couvent des Minimes before, but I love L'Occitane products. Their verbena products are among my favorites – I love the cologne: it's tart, lemony and refreshing. Their lavendar products are also wonderful smelling. Another (much more expensive) verbena I also liked was by Jo Malone. L'Occitane's is not vastly different, and much more affordable though. On those grey gloomy days when it feels like winter will never end, Lemon Verbena is the best! The JM Verbena didn't work on me, but to be honest I can't remember why! At the L'Occitane shop near me they keep what they have in the Verbena line right next to their Green Tea stuff, which I think actually hurts the sales of the verbena – it seems so plain jane in comparison. It's nice, refreshing, but not as lovely as some others from them. I do love that they offer so many of their scents in those smaller travel bottles, and really wish many more places would follow suit. It's just so frigging convenient. K, agree on the small sizes….wish I would find one in the new Green Tea w/ Mint. Can't make up my mind if I like it or not, and they never have a sample. This is like one of my favorite perfumes. I wear this nearly year round and always get compliments. I used to wear L'Occitane Vanilla too until they changed the formula or discontinued. I would layer the Verbena and the Vanilla together and it was a FAB combo. Will be enjoying my new Le Couvent des Minimes Verbena & Lemon Scented Candle over Christmas – can't wait! It's a brand whose products look mildly expensive but whose price points aren't a burn (pardon the pun) – perfect for gift-giving, or a little self-indulgence. Hey, let me know how it is! I'm always after cheapie candles. BTW, in Australia this brand isn't as cheap as it is in the States – the candles cost about A$50 I think. Lucky I got it for $10. Oh, that's a shame — thanks for letting me know!